The Pavilion stage underwent its final transformation of the Monlam into a space of simplicity with just the Buddha, a tall flower arrangement on either side of him, and in front, a seat and table for the Karmapa. The rest of the stage was cleared to give maximum space for this evening’s performers at this Marme Monlam, the Lamp Prayer. In front row of the audience were seated the Karmapa, Gyaltsap Rinpoche, Mingyur Rinpoche, Bokar Rinpoche’s Yangsi, and numerous other tulkus and khenpos. Also attending were two lamas from Hong Kong, the Ven. Master Kung Siu Kun and the Ven. Master Sik Yun Tsun. A formal invitation had been sent to Indian dignitaries and many were present. Among these honored guests seated near the Karmapa were Amitabh Mathur, advisor to the Ministry of Home Affairs on Tibetan affairs; the District Magistrate of Gaya, Kumar Ravi (Indian Administrative Service, IAS); Senior Superintendent of Police of Gaya, Garima Malik (Indian Police Service, IPS); Airport Director, Dilip Kumar; Bodhgaya Temple Management Secretary, Nangsal Dorjee (retired IAS); Indian Government Liaison Officer, Lalit Kumar; and Central Tibetan Administration, Department of Religion and Culture, Karma Thinley. Also adding their presence to this concluding ceremony were the leaders of all the main monasteries in Bodh Gaya as well as heads of the major NGOs in the area. 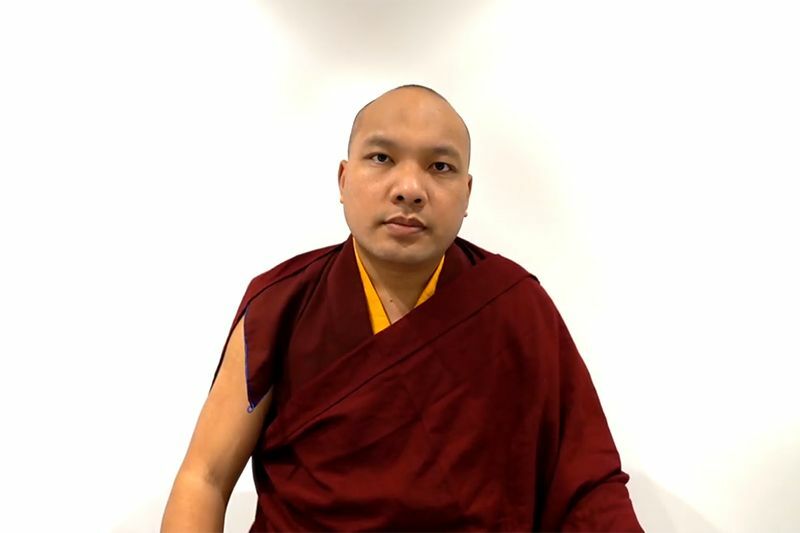 In the beginning, the Karmapa was invited to speak, and after extending a warm welcome to everyone, he spoke about the purpose of the Kagyu Monlam. By training in compassion for three countless eons, the Buddha brought compassion to its perfection. Due to this, when he engaged in taming and subduing living beings, he was not limited to a single method but knew many different ways to benefit beings. This could be seen as a special aspect of the Buddha. Though we cannot do it exactly as the Buddha did, we are trying to use a variety of ways to plant the seeds of liberation, to create Dharmic imprints within the being of all those who have come. We were joined by the Sanghas of many different countries. This is to send the clear message of our wish to have strong and harmonious connections with all religious traditions, especially other Buddhist Sanghas. We have given considerable thought to this, and it is good that everyone here know of this intention as well. The theme for this evening is the environment, so the performances tonight will depict the situation of the environment and how important it is. Especially in our 21st century, protecting the environment is the biggest challenge we face. The main point I’d like to make is that this evening’s program resembles the preparations parents make for the time when their children return home after a long absence. The parents cook the best food possible and do all they can to make the occasion enjoyable. It is the same for us here at the 34th Kagyu Monlam. We have tried to make everything as meaningful and beneficial as possible. We thought, “Oh, an empowerment would be good,” so we added that to the schedule. 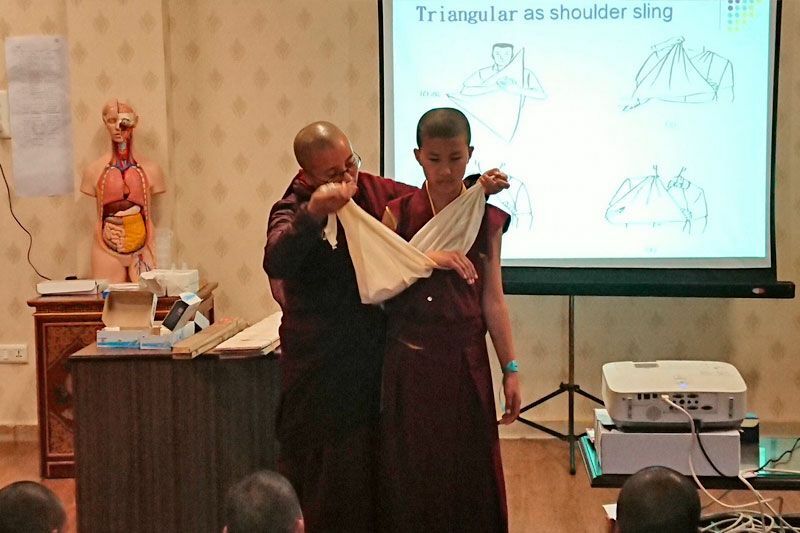 “Dharma teachings would bring blessings,” so we included them. Making the schedule like this is easy, but implementing it is much harder. Sometimes I even get angry with myself for filling it so full. But I think it should resemble the feeling parents have in anticipating the return of their children. I hope you all feel the same way, that you enjoyed the programs we have set up, and that they will benefit you in the short term and ultimately. During the Marme Monlam, it has become traditional at the Monlam to begin the evening’s program with the practice of Avalokiteshvara known as Benefitting Beings Throughout Space, the greatest method for receiving his blessing and developing compassion. As the lights came up, the burgundy and yellow-robed Sangha filed in to array themselves in perfect rows, fanning out along the semi-circle of the marble steps below the Buddha. The chanting began with the nuns from Drupde Palmo Chökyi Dingkhang Nunnery of Khenpo Tsultrim Gyatso in Bhutan, and then the monks from the Vajra Vidya Institute of Thrangu Monastery joined in. At one point their traditional chanting shifted into a lovely western harmony that was a new touch. Afterward Mr. Zheng Yong Chen on the suano (resembling a simple, straight trumpet) and Ms. He Yi Jie on the mouth organ played a traditional Taiwanese melody entitled, The Hundred Birds and the Phoenix, to remind everyone of the enjoyable qualities of celebrating the New Year, and the need to maintain and spread such joy. Protecting the environment includes being stewards to the snowy mountains, the crown jewels of the earth, which according to Tibetan tradition host gods, nagas, local deities, spirits, heroes, and dakinis. Li Kong Yuan from Taiwan, composed the song, Flowing Water, for the zither, a stringed musical instrument, placed and played horizontally. He plucked and strummed as if recreating the sound of water dripping slowly and descending down the snowy mountain, reminding the audience of the importance of mountains for nourishing our water supplies and sustaining our climate. 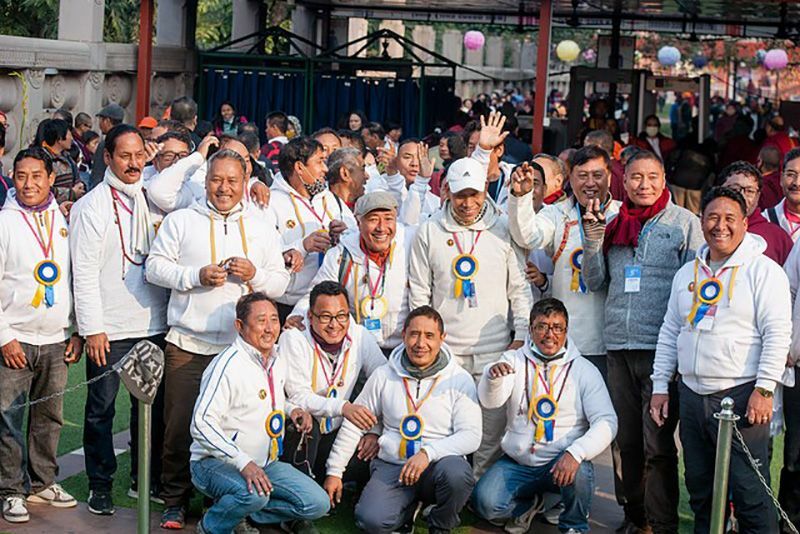 In the spirit of demonstrating both a commitment to the interconnected relationships among the various lineages across Buddhist communities world-wide and an on-going concern for the environment, the well-known Bhutanese playback singers, Mr. Karma Phunstok and Ms. Chimi Wangmo, composed a new duet especially for the Marme Monlam entitled, A Song Dedicated to the Karmapa. Both performers expressed their gratitude for the opportunity to create and perform their offering to His Holiness. Next, two Mongolian artists performed a song that touched on the relationship between humans and animals. As Mrs. Khongor Zul sang in a piercing, high voice, loved by Tibetans, too, Mr. Munkhzaya played the Mongolian horse-head fiddle with the resonant sound of a viola, rendered complex by feedback cycles playing against their own overtones. The story behind the name of his instrument is that once there was a poor boy who fell in love with a girl whose father did not like him. The boy was riding his horse to come and see the girl, so the father killed the horse. From it, a musical instrument was fashioned: the horse’s head became the sounding box, the hair of its tail became the strings, and so forth. Q: Have you ever played for a spiritual teacher before? NS: No, but one great thing that happened to me was interviewing Nelson Mandela. I think he was an amazing human being. I can’t, however, think of any spiritual teacher off the top of my head. MM: This is the first time then. The surging waves of River Pulse flowed out through the crowd and into the space beyond, where the distant Mahabodhi Stupa illuminated the night sky. The Mongolians returned augmented by Mr. Liter from the area of the Blue Lake in a Tibetan and Mongolian cultural area, and by Mr. Yavgaan, father to Mr. Munkhzaya, and famous throughout his homeland for his throat singing. His long blue robe reflected the deep azure of the vast Mongolian skies. At 71 years old, he has been singing for 64 and performing for 50. Music is in his family’s tradition so he learned the special techniques of throat singing from his brother and has passed the love of music to his son, performing with him tonight. In an earlier interview, Mr. Yavgaan spoke about throat singing and how he makes this especially resonant sound. He indicated his belly, heart, throat, and forehead saying that they all have to resonate together as a whole, so there’s a flow like a river’s current; otherwise, the sound does not come. For the listener, the singing cycles up high and down low, and often it is difficult to tell exactly where the sound is coming from. The group gave a rousing performance of a song about the Mongolian landscape, its grasslands, a tall mountain, the nomad life of changing residences in the summer and winter, and the great vistas in areas so isolated, one can go for 100 kilometers and not see anyone. At the end of their piece, the artists raised up their instruments with both hands, making an offering of their music. Karma Sönam Palden from Taiwan performed a song that juxtaposed the effects of earthquakes caused by buddhas and bodhisattvas, which are harmless and generate mental and physical equanimity, against those created by the shifting and accumulated friction of the earth’s plates that are the source of immense suffering and pain for communities world-wide. The lyrics were composed by His Holiness and the music by Karma Sonam Palden. 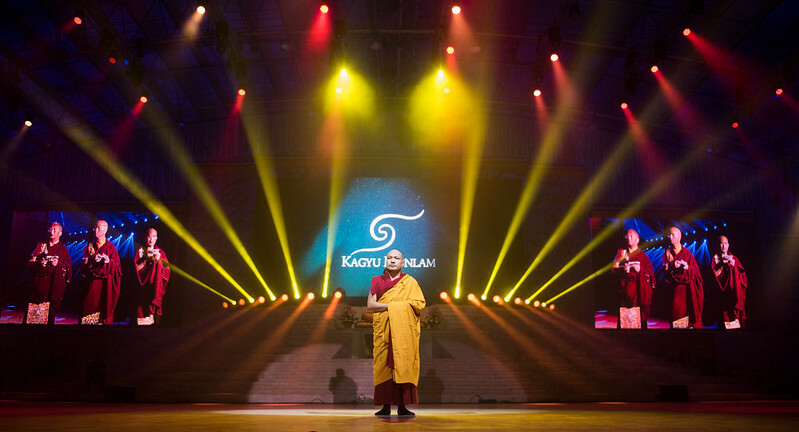 Before His Holiness concluded the 34th Kagyu Monlam, the penultimate act included two well-renowned guitarists and twenty performers. These musicians from China and artists from the Tibetan Institute of Performing Arts (TIPA) performed two songs about recalling and supplicating the guru with devotion and beseeching the great master for blessings. His Eminence Pawo Rinpoche, one of the heart sons of His Holiness, composed the Classical Mandarin lyrics for the first song, which the musicians set to traditional Chinese music. 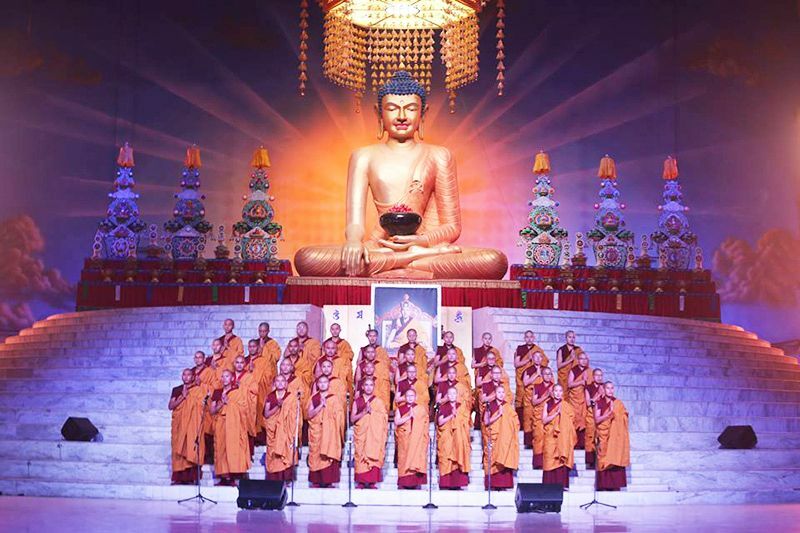 Following a solo, performers joined a young professional Chinese singer in accompaniment to this devotional song, whose refrain was Karmapa Khyenno. The final song was a rock performance that began with dueling guitars that transitioned into Tibetan lyrics taken from mantras and the refrain Karmapa Khyenno. A young Tibetan monk and Chinese child performer stole the final act with their eager smiles and earnest off-beat clapping. For the finale, all the performers descended the stairs and lined up across the front of the stage swaying while rallying the crowd into rhythmic clapping, bringing the performances to an up-beat and lively closure before a final supplicating bow to His Holiness. As usual, the evening closed with the offering of lights. The master of ceremonies explained that the forms of light we usually offer actually represent a very profound lamp. As a lamp is essentially luminous, so the essence of our minds is luminous wisdom. Within the nature of this luminous wisdom, the unceasing display of wisdom is called the vast realm of the dharma expanse. The ultimate teaching is to rest freely in the luminous essence of the mind itself without altering anything. When devotion—the quality that is sufficient on its own—reaches the critical point, luminous wisdom—the self-arisen, essential nature of mind—is revealed free of obscuration. This is merely designated as the ultimate result, the dharmakaya. In actuality, the ground to be realized is the luminous essence of mind; the path to practice is the luminous nature of mind; and the result is realizing the luminous nature of mind. The essence of luminous, self-arisen wisdom that is the nature of our minds is the greatest lama of the definitive meaning. 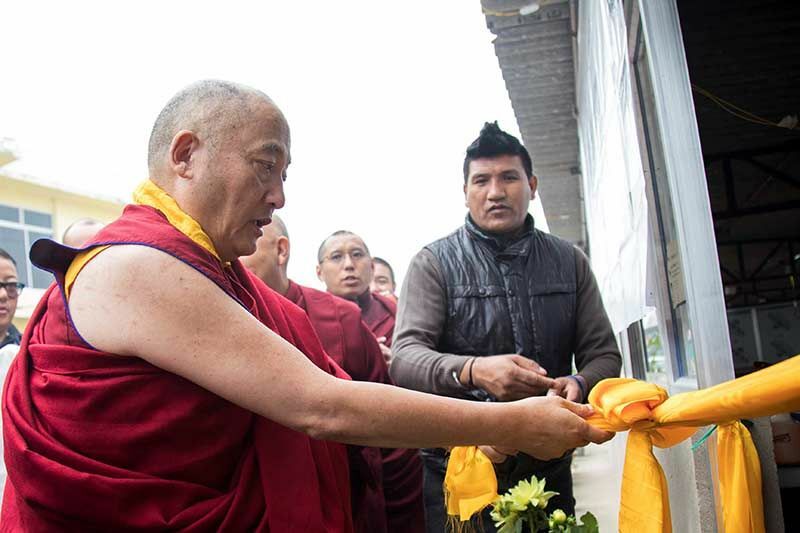 With this profound understanding, the audience was asked to sing the Lamp Prayer, composed by Atisha, whose relics were recently offered to the Karmapa. First he read the text in sections, which disciples repeated in Tibetan followed by English and Chinese. Then the prayer set to music rose from the depth of those present. The Karmapa held his lotus lamp at his heart as two nuns walked up the stairs to his seat and, lighting their lamps from his, passed the light to the sangha on either side of the Karmapa. Through the expanse of the audience, one by one the lamps were lit, becoming constellations of moving flames to illuminate the night. In uninterrupted fullness fill all directions to their ends. May this always flourish and may this flourishing be auspicious!